Custer, SD, April 3, 2019 – Congratulations to Leah Bifulco and Sherri McDermet of Custer, SD. 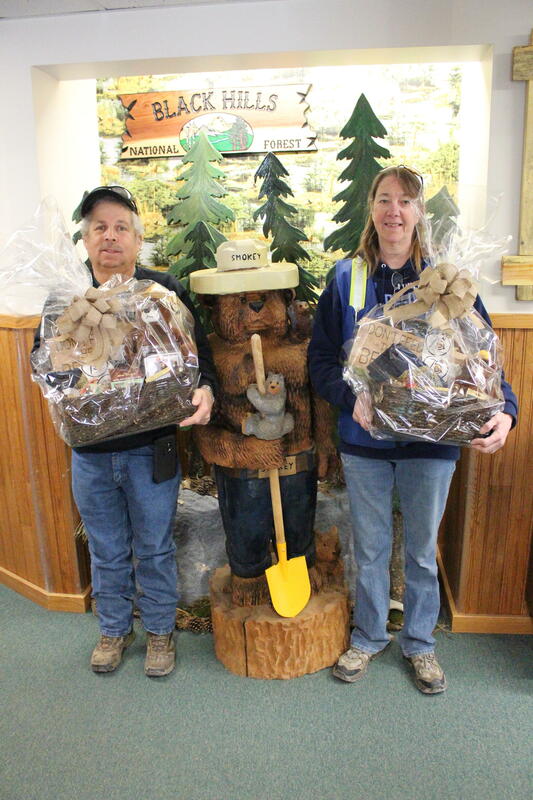 Leah and Sherri were the winners in the drawing for the Smokey Bear prize baskets. Over 100 visitors came to the Supervisor’s Office / Hell Canyon Ranger District in Custer to view Rudolph “Rudy” Wendelin’s historic replica portraits of the notorious Bear that were on display from March 11-22. The display was set up to honor Smokey Bear for his 75th birthday this year. Smokey Bear officially turns 75 on August 9th, 2019. A big thank you to Black Hills Parks and Forests Association for donating the prize baskets. Pictured are Steve Davis, receiving the basket for his daughter Leah Bifulco, and Sherri McDermet. Both winners are from Custer, SD.